AS THE LINE between mobile and non-mobile gaming becomes increasingly blurred, there's a tendency to qualify games that exist in both realms as being primarily part of the former, and only secondarily part of the latter. Often there are valid reasons: when the highly anticipated PC launch of Chrono Trigger was discovered to be simply a port of the mobile version, many longtime fans were deeply disappointed, and cries of "cash grab" filled the Steam reviews. Mobile dictates its own limits in everything from screen size to controls to the overall download size, and as long as mobile and PC/console specs are compared side-by-side, the latter wins nearly every time. But the coming mobile/PC singularity, coupled with the resurgence of archaic game genres and engines (point-and-click, 8-bit, text-based, etc. ), demands a reassessment of the mobile-is-less worldview. The plurality of "smaller" games (whether that means old titles now easily portable to mobile like Myst and the early Grand Theft Autos, or new games that use the simpler mechanics of decades past) on Steam and the app stores suggests we're approaching a time when games will come as increasingly smaller and shorter experiences. Since the basic format of the game is a square divided into four smaller squares, each of which can be moved, it also has strong parallels to comics and other graphical forms of storytelling. This format suits the mobile version of the game perfectly: tapping, sliding, and otherwise fussing with the panels feels more than natural in a smartphone context. 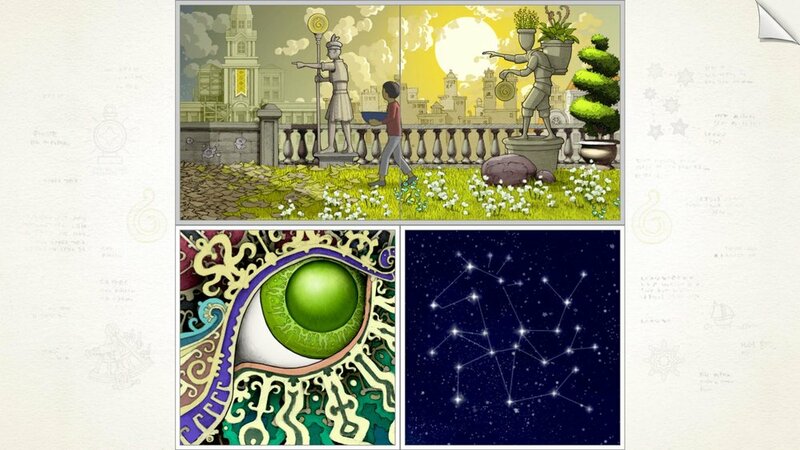 But while many mobile games reward frenzied tapping and lightning reflexes, Gorogoa rewards the opposite: close visual examination of hundreds of visually arresting panels, followed by gradual, measured movements and adjustments. Based on the context, moving one panel over another will sometimes automatically swap the two and sometimes cause them to overlap, leading to hybrid panels that often come to life with short animations. Placing two particular panels side-by-side will sometimes cause them to link up seamlessly, leading to new paths through the game's surreal realms. The player "character" (which sometimes disappears from the game completely for long stretches) waits patiently for new viewpoints and paths, while the actual player plays God by sliding the four quadrants of the universe back and forth. Aesthetically, the world of Gorogoa is quietly dreamlike, with classical architecture, secret gardens, old books and photos, strange machines, and an ample spread of archetypal imagery. The game's artwork (entirely hand-drawn by creator Jason Roberts) stands beautifully on its own, but reaches an even more impressive level of beauty in the way its panels move and interact. The artstyle is reminiscent of both Moebius and Shaun Tan (The Arrival) without being derivative, and does an impressive job of marrying the freedom of indie-game aesthetics with the crystal-clear resolutions and crisp outlines of mainstream mobile gaming. While the game doesn't have a storyline in the traditional sense, it does proceed in chapter-like thematic chunks, with one overall path from start to finish. Despite the creative geometric machinations it requires, there is just one solution to nearly every puzzle, meaning the game's replay value is based on leaving sufficient time between subsequent playthroughs to forget at least some of the solutions. In this sense, it's similar to Annapurna's other major title, What Remains of Edith Finch: while both games are exquisitely immersive, almost mystical experiences, they offer relatively linear experiences that do not differ much from one playthrough to another. The collective playtime of both hovers somewhere around 6 hours, meaning players who pay full price for either could be forgiven for grumbling somewhat about replay value. It's thus especially impressive that both games rate "overwhelmingly positive" in the notoriously cranky metric of Steam reviews, and shows that games with a fully-enough realised artistic vision need not worry too much about their hourly price of admission. 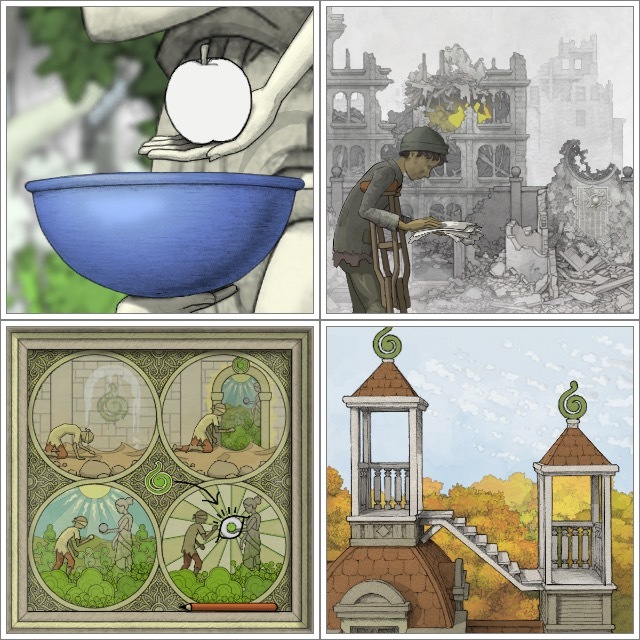 Progressing through Gorogoa provides an experience that hovers somewhere between meditative and thrilling. Its primary theme could be called "illumination", both in the ancient mystical sense of representing the divine in art and in the more practical or monastic sense of illustrating manuscripts. It elegantly transcends the games-as-art debate by presenting an interlocking series of artworks that are themselves a game, and rewards careful observation, patience and aesthetic appreciation without insisting on them.